With over 4,000 police agencies using our products, VIEVU is the largest body worn camera manufacturer for law enforcement. 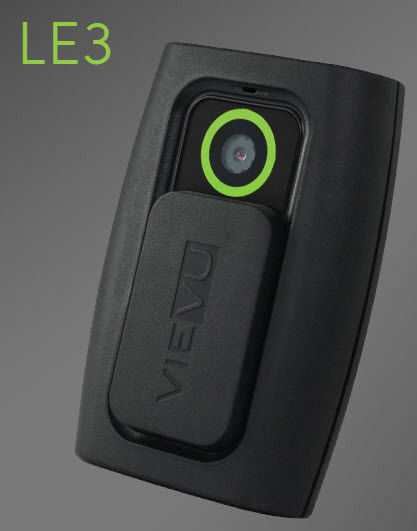 VIEVU's products are law enforcement / military grade camera systems. Built tough for professionals. Our body worn video cameras are easy to wear and use. Holding a video camera does not always make sense. Use VIEVU to record hands-free video & audio from your point of view. Is liability hindering your work? Are you compromising your services due to concerns for potential lawsuits or complaints? VIEVU body worn video cameras allow you to do your best work without fear of repercussions. Our wearable video cameras save you time. They improve document efficiency and reduce paperwork. You will increase accuracy and accountability in a wide variety of environments. The LE3 is rugged, waterproof and easy to use. The camera clips to a uniform to record both the actions of the wearer and those in its field of view. LE3 features include HD video resolution, 16GB internal memory and up to 12 hours of record time. The LE3 camera is powered by VIEVU's VERIPATROL software system. Video evidence is securely stored and cataloged with a FIPS 140-2 compliant digital signature process to verify the video has not been altered. Additionally, if the camera is lost or stolen, VIEVU's VidLock security software will prevent unauthorized access to video evidence. The VIEVU LE3 body worn camera provides public safety organizations a ruggedized, waterproof, secure camera to record situations as they happen. With a 68 degree lens, the LE3 offers a wide field of view. Video data is downloaded directly to VIEVU’s VERIPATROL software system. VIEVU’S LE3 video data is stored with a FIPS 140-2 compliant digital signature that confirms the video has not been altered. VIEVU’S Vidlock security software prevents unauthorized access to the video data in the event the camera is lost or stolen. VIEVU products meet or exceed International Association of Chiefs of Police (IACP) standards for police video. The video format is .AVI MPG4 in the popular Xvid codec. The unit has a LED status light to indicate the function of the unit and warn the user when memory or battery are running low. VIEVU PVR-LE2 is FCC and CE certified. VERIPATROL video evidence management solution is FREE with NO re-occurring costs!! !